Holiday closure: Library will be closed on Friday/Saturday, March 30/31, in observance of Cesar Chavez’s birthday. Book drops remain open and available on holidays. This branch closed on Sundays. Classics Book Club will be discussing Leaves of Grass by Walt Whitman. Monday, April 2 @ 3:30 p.m.
Concert: Jarabe Mexicano – Performing on traditional mariachi instruments accompanied by lively percussion, Jarabe’s arrangements feature stunning harmonized vocals in Spanish and English. Wednesday, April 4 @ 6:30 p.m.
Qi Gong (Chi Gong) is a simple preventative health method of relaxing and harmonizing the body. These gentle exercises are suitable for any age and health condition. 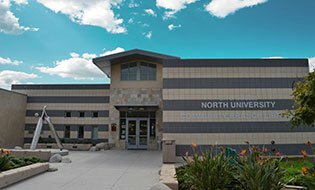 Friday, April 6, 20 & 27 @ 9:30 – 11:30 a.m.
University City Community Association – This is a community meeting featuring updates from law enforcement, fire-rescue service, legislative and other community leaders. All are welcome. Wednesday, April 11 @ 6:00 – 8:00 p.m. Jewelry Making, take home something you made yourself! Make your own earrings and/or other pieces of jewelry with an experienced crafter. Space is limited, please call (858)552-1655 to RSVP. Friday, April 13 @ 10:00 a.m. & Noon. Accordion Club meets the second and fourth Saturday of each month. All are welcome! Saturday, April 14 & 28 @ 9:30 a.m. – 12:30 p.m.
Meet the Neighbors – Photographer Ed Sweed discusses the Witness2Resettlement project, which documents the lives of Syrian immigrants as they adjust to a new life in San Diego. Saturday, April 14 @ 1:00 – 2:30 p.m. OASIS: Surf, Sand and Stone -Dr. Keith Meldahl discusses the complex geologic history of the California coast, from Santa Barbara to San Diego. He discusses how the coast’s features developed and how they are continually changing. Tuesday, April 17 @ 1:00 – 3:00 p.m.
UC Book Club will be discussing Life in the Time of Cholera by Gabriel Garcia Marquez. 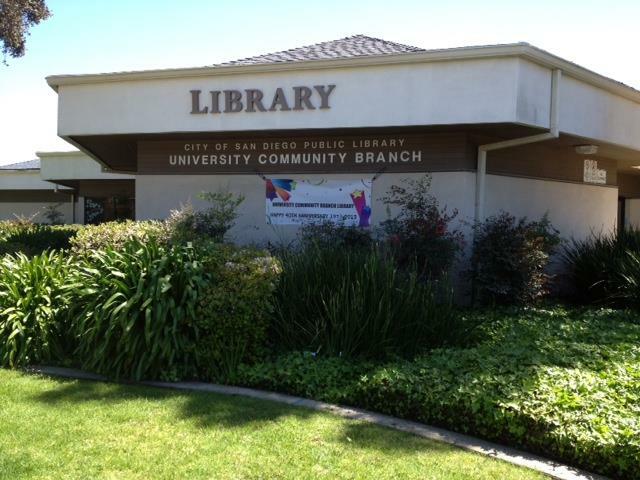 Wednesday, April 25 @ 2:00 p.m.
University Community Library Anniversary Party. Come celebrate with us. Saturday, April 28 @ 1:00 – 3:00 p.m. Homework Help – A volunteer will be at the library to help with homework. Available till May 4, 2017. Tuesday @ 2:30 p.m. to 4:00 p.m.
Wild Wonders – Come take a walk on the wild side, when Wild Wonders and their animal ambassadors visit our library! There’s no telling what animals you might see! Wednesday, April 18 @ 2:00 p.m. Girls Who Code Club – These are programs for 6th to 12th grade girls to explore coding in a fun and friendly way. Space is limited, please call (858)552-1655 to RSVP. Tuesday, April 3, 17 & 24 @ 3:45 – 4:45 p.m.
Spring into STEAM – Ozobot Moon Adventure. Teams will develop codes using markers to guide a mini-robot, called an Ozobot. This program is geared towards ages 9-12, to register, visit: sandiego.gov/steam. Wednesday, April 11 @ 2:00 – 4:00 p.m.
LEGO Club – Come build anything you can image with LEGO. Wednesday, April 4 @ 2:00 p.m.